This paper studies Bayesian inference on longitudinal mixed effects models with non-normal AR(1) errors. We model the nonparametric zero-mean noise in the autoregression residual with a Dirichlet process (DP) mixture model. Applying the empirical likelihood tool, an adjusted sampler based on the Pólya urn representation of DP is proposed to incorporate information of the moment constraints of the mixing distribution. A Gibbs sampling algorithm based on the adjusted sampler is proposed to approximate the posterior distributions under DP priors. The proposed method can easily be extended to address other moment constraints owing to the wide application background of the empirical likelihood. Simulation studies are used to evaluate the performance of the proposed method. Our method is illustrated via the analysis of a longitudinal dataset from a psychiatric study. 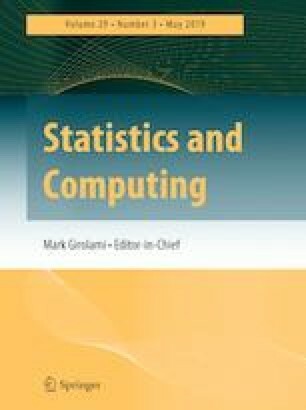 The authors appreciate the Associate Editor and three referees for their constructive comments and guidance to the current version. The authors thank Prof. Yuichi Kitamura for providing their slide of the manuscript and Prof. Min-Hui Chen for his suggestions during the revision. The first author was partially supported by the National Natural Science Foundation of China (11171230, 11471024); the research of the first two authors was supported by the Scientific Research Level Improvement Quota Project of Capital University of Economics and Business; the research of the third author was supported by the postgraduate studentship of Hong Kong Polytechnic University; and the research of the fourth author was partially supported by the National Natural Science Foundation of China 11401502, the Hong Kong Polytechnic University fund G-UB01, and the General Research Fund of Hong Kong 15327216.